Keeping kids entertained on the road — whether infant or college-aged — is always a challenge. Devices have limited battery life and people have short attention spans — young ones especially. So what is a family to do? Use road trips as a bonding opportunity. Being in the car puts everyone together in one space and can make for some great times. However, we can also get under each other’s skin. To prevent that from happening, here are some simple family road trip games that will keep all ages entertained. Nearly every summer growing up, my family made the twelve hour drive from Missouri to the Michigan Upper Peninsula. “Collecting” license plates helped keep us kids busy and competitive. Start by printing out a stack of blank U.S. maps. Each person starts with a map and a writing utensil. Color in each state you spot. This game is great because you can always add your own rules and bonus points. Does the out-of-state plate have a vanity message? Color the state in a different color to mark the bonus point. See a Canadian or Native American reservation plate? Decide what to do with the oddities and fuel the competition. You can also set time limits. Each time you cross a state border, total up the points and see who won the round, then start with a fresh map. We all know this one. Use billboards, road signs, or bumper stickers to spot each letter of the alphabet. Or set the rules to only objects: Automobile, Bridge, Crow, and so on. Before the days of portable video games and smartphones, kids played games with a pencil and piece of paper, or by using just their imaginations. Hangman – Guess the message, Wheel of Fortune style, before the man is hanged. 20 Questions – Everyone asks one person 20 questions to guess the animal or object, with only “yes” or “no” answers. I spy – I spy, with my little eye, something red. Would You Rather? – Would you rather have no heat or no air conditioning in the car? I’m Going on a Picnic – I’m going on a picnic and I’m bringing Apples, Beef, Carrots, and so on. Can anyone remember all 26 things? Yellow Car – Everyone gets a point when they see a yellow car. Of course, you can also change the color and type of car to look for. It might be a challenge to play Uno or Blitz in the car, but it’s doable. Take some time before your trip to check out travel card games online. I need to spot: a dented bumper, police car, and a cow. Have someone be the DJ using iTunes or Spotify. The DJ may start any song they like. The first person to guess the song wins. You can up the stakes by including the artist name too. How soon can the kids recognize the guitar riff for Sweet Home Alabama? Every parent’s dream: Nobody make a sound. The last kid standing gets a piece of candy. Simple yet effective. Scavenger hunt games are fun and come in more than one form as we have already covered. 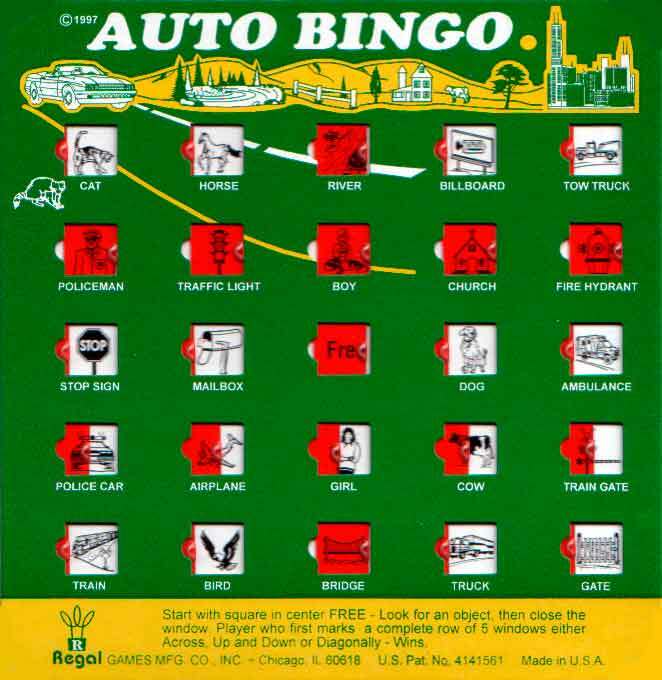 Grab some car bingo boards in a gift shop or online, or have the kids draw their own (and shuffle the stack). The first person to spot enough items and shout “Bingo!” wins! A cheap and effective solution to road trip boredom are road trip game books. Most dollar stores and gift shops have books designed to keep kids busy. They can cover wide age ranges, including things like Mad Libs, riddles, Sudoku, mazes, word puzzles, stories, jokes, the list is endless. While family bonding is important, it should be mentioned that the driver shouldn’t partake in some of these activities. Not only is it unsafe, but distracted driving sets a poor example for your future drivers. The key to solving boredom is encouraging creativity. Remember that no game has any set rules and everything can be as custom as the kids make it. Happy travels! Family-Friendly Fun in Branson, Missouri!